Our Bentley Bentayga has had its first service. How much do you reckon it cost us? Service intervals get ever longer but they’re still a pain when they run out – especially when your car is a mile-muncher like our Bentley Bentayga. And extra-especially since nowadays there’s absolutely no indication from the way a car drives that it needs attention. A 1990s Bentley might have given a hint or two along the way: the Bentayga just drives the way it left the showroom. As the 10,000-mile cut-off approached, I started counting down from 9200, meaning to make an appointment every day. But I still overshot. And at 10,200, I suddenly discovered an urgent 600-mile errand. Would it be okay to add that extra mileage? We decided it wouldn’t, so contacted HR Owen’s Bentley service people in a bit of a panic, knowing demand is often so strong that even top cars like our big SUV often have to stand in line. Good news, though. At a day’s notice, senior service advisor Katan Wara found us an emergency slot, sent one of his drivers over to collect the car from our Twickenham HQ and take it to HR’s Wandsworth garage. A day later, it was back, valeted, serviced, immaculate and driving exactly as before, ready for another 10,000 miles. The work cost £810, which struck me as pretty solid for a 2hr 10min job, although that price comes straight from the service menu, including VAT, with oil, filters, wiper blades and remote battery changed. The first post-service trip was a particular joy. 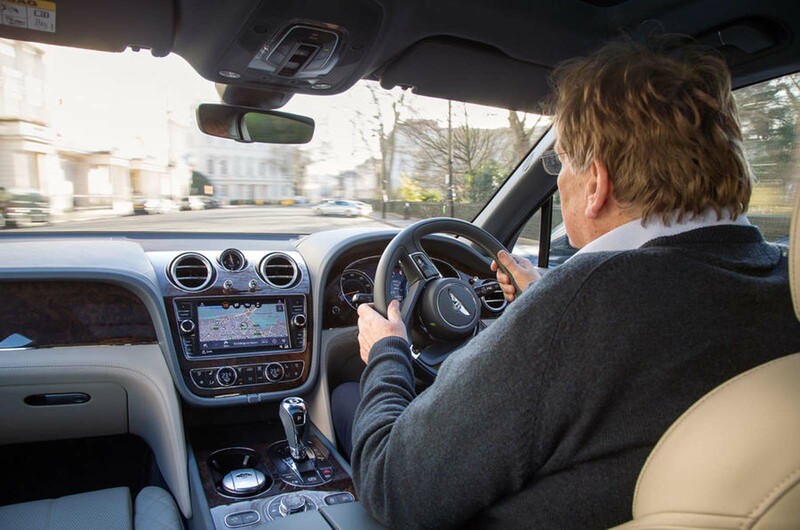 Whether you’re in a Bentayga or a Vauxhall Viva, there’s special pleasure in driving your immaculate car just after it has been titivated by experts. Our Bentayga has reached its first service at six months and 10,000 miles without a single fault or flaw, a feat in such a complex car, even if (as people keep saying) that’s what you should get in a £197k car. 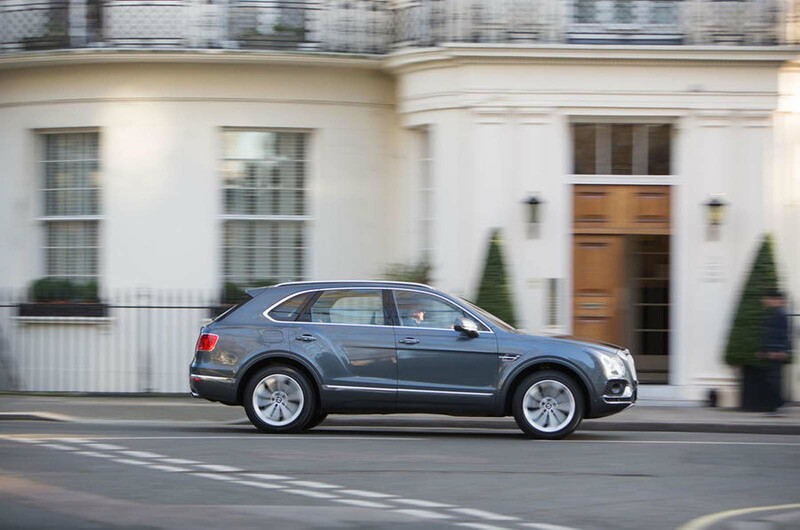 Our Bentley Bentayga is bolting with dizzying speed towards its first service. The electronic log currently says it has 1500 miles to run. It has accumulated miles so quickly because (like most owners, I suspect) we use it almost exclusively as a mile-eating grand tourer. One or two owners I’ve seen in the Cotswolds where I live have given their Bentaygas the role of GT-car- with-horsebox, a task at which it seems to excel. But every owner I’ve met agrees it’s no city car. It’s a big-occasion car, and not much good at squeezing into an average parking space. In town I use one of those higher-priced, more spacious inner-city Q-park sites (my other half calls them ‘gentleman’s car parks’) but that’s not a catch-all solution. Best to do what the rich do and use a smaller car in urban areas – or get Smiggins to drop you off and collect you later. The burning Bentayga topic of the moment – as just about everywhere – is: are diesels any good? Although in the Bentley’s case the question is being framed rather differently. 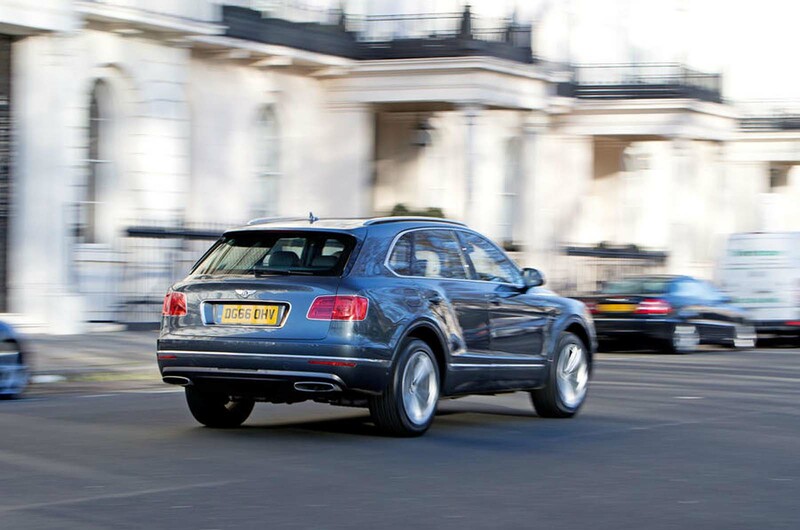 Instead of regarding the diesel as a potential mistake, prospective owners, having seen that the Bentayga Diesel has just achieved a rare five-star Autocar roadtest rating, are wondering if the oil-burner (which is £30,000 cheaper than our W12) is the better and more practical version. There is certainly an argument to be made for the diesel, because the first-ever Bentley diesel is sensationally refined. But after more than 8000 miles, I continue to argue for the W12 – for its exotic nature, for its all-Bentley 12-pot heart, for its decisively better performance (it’s a second faster to 60mph and delivers bigger margins further up the range) and for the fact that its reasonable 22mpg overall – with an easy 350-mile range – protects you from the worst problems associated with ownership of a huge, 600bhp car. To Wales from London, four up, laden for a week’s stay and nursing a sore leg, the legacy of old age and amateur running. The former I expected the Bentayga to cope with, especially with the recent adornment of a roof box; the latter I expected to be nursing with little sympathy. The roof box is a controversial addition. Initssmart, dark paintwork, I reckon the Bentayga is understated – if an off-road Bentley can ever be described as such. The roof box lends the car a purposeful look and forgives some of its excesses. The box is contoured to carry skis and accessories, although in our case it made do with wellies and big coats for a trip to the Preseli Hills. It was convenient for swallowing the luggage and allowed us to keep the boot mud and clutter-free. There are many makers of roof boxes, many charging less than the £2757 (including roof bars and ‘load assist’ tray) Bentley asks, but there’s no doubting its suitability for the job. Likewise its motorway-munching – and knee-healing – qualities. As I exited the M25 and began the trip down the M4, I started playing with the cruise control functions. By the time I’d set the speed control, distance control, speed limit sensors, lane-keeping assist and auto braking, accelerating and steering, I started to wonder what was left for me to do. It was my first prolonged exposure to such an integrated system. With the M4 relatively empty, so long as I kept my hands resting lightly on the wheel I didn’t have to offer a single input. It’s surprising how quickly you get used to watching a steering wheel being adjusted on your behalf. By the Severn Crossing I’d covered almost 100 miles without doing a thing, and the aches and pains coming from my rested knee had subsided. I always knew the Bentley’s fuel economy would be steep (18- 22mpg), but I didn’t expect it to drink screenwash quite the way it does. You have to fill it every week or so. It stands to reason, what with all those screen jets, the tendency of the rear screen to need a lot of cleaning and the consumption of the integral headlight washers. With everything on, it’s like the Niagara Falls. Having established within our first few hundred miles that our new Bentley Bentayga is fine for every mode of motoring (except perhaps for cramming into supermarket car parks), I spent a lot of time investigating its popular appeal over a few weeks by toting different groups of passengers to and from events. It proved very instructive. 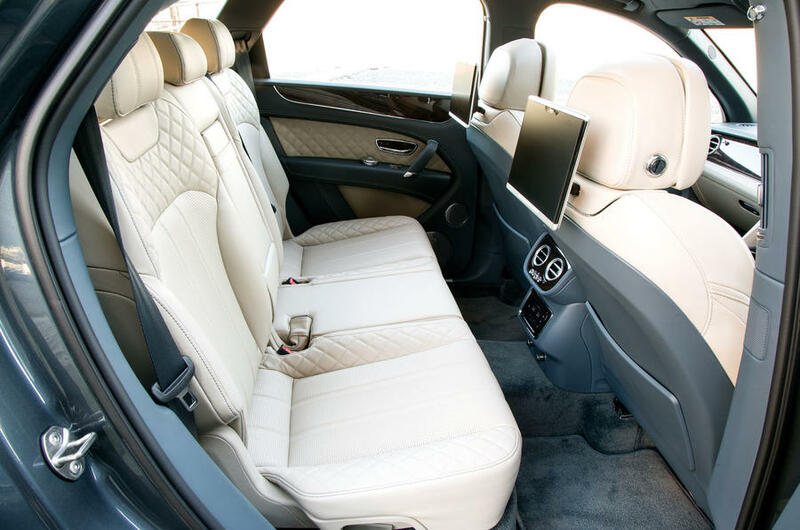 Everyone who travelled in it remarked on two things: the way the 6.0-litre W12 engine is so refined as to be almost noiseless even at brisk speeds; and the supreme rear-seat comfort. 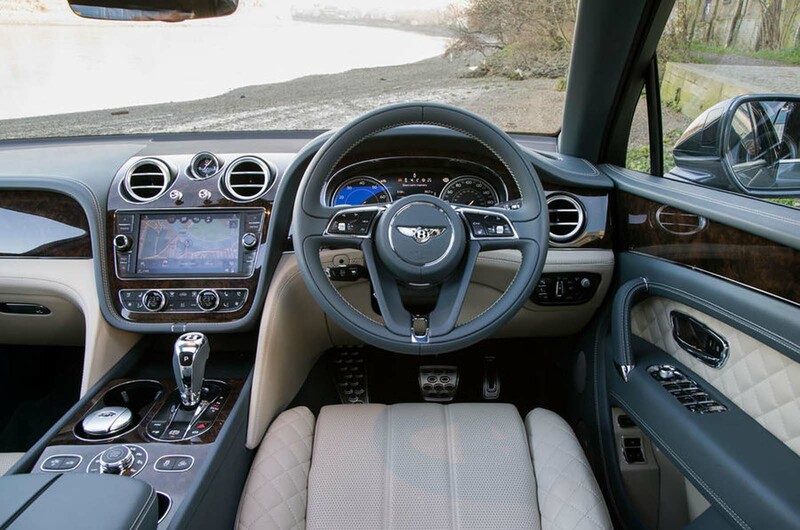 It’s absolutely vital that our £197,000 SUV should get the popular nod on rear-seat comfort: the model is already being extensively used by Bentley Motors itself for chauffeuring top people and, even more importantly, most of its Far Eastern owners – of whom there are plenty – will usually be driven rather than drive. Apart from travelling in comfort, one special Bentayga advantage my occupants noted was its entry and egress. It is easy and more dignified getting in and out of a vehicle of such imposing height and with such large doors. Two caveats, though. As you look through a rear door, the seats don’t look as imposing as the rear compartments of some limousines. 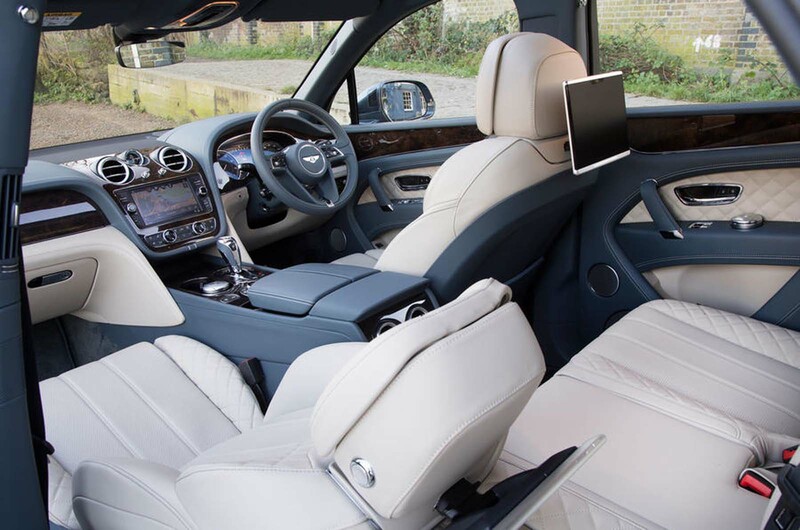 And although there’s enough leg room, even for big people and even behind a big driver, there doesn’t seem to be quite the sprawling room offered in a long-wheelbase Range Rover, almost identical in length. Bentley is rumoured to be working on a longer Bentayga for markets where rear space counts as the greatest luxury of all. For the rest of us, the present edition works very well. Opinions vary over whether the Bentayga looks big or small. Stand by the mighty grille, or clock the height of the big bonnet, and there is no doubting that this is a very big car indeed. Negotiating streets in inner London soon tells you plenty about its width, too. Yet the car is in such good proportion – its wheel sizes, ground clearance, overhangs and height all matching one another – that viewed from a distance, it can appear quite compact. If you’re looking for a vehicle to make the car designers’ enduring point that good proportions matter, the Bentayga really does the job. So,nothing new really,great to driven I guess,supreme comfort,first time I sat in the back of a RangeRover I thought,WOW! ,so, if I read unimpressed it is because......I am not! Are we looking at the same thing? To quote: "If you’re looking for a vehicle to make the car designers’ enduring point that good proportions matter, the Bentayga really does the job." It occurs to me it was designed by "chop shop". The east end custom garage on tv. If in doubt look it up and you will see what I mean. I suppose a car that looks like a jumped up London Taxi has to cater for passengers. Have you been looking at a scale model, maybe? This thing looks about as compact as a Range Rover, or a tall large Bentley, which is what it is. Steve Cropley is a tireless defender of Bentley. Aesthetically speaking I find Bentley, not only this hideous Bentayga but the entire Bentley range, to be well below the standard of what one expects from a luxury brand. Their cars look heavy, lumpy, visual elements are often poorly coordinated. The Bentley design language lacks the simplicity and relaxed confidence of eg. Rolls Royce Ghost and Phantom. By trying too hard Bentley designs only expose their weaknesses. I agree with Mr Cropley. I agree with Mr Cropley. There is a deception that this vehicle looks smaller than it is. That isn't to say it looks like a small car. I'm not a car designer, I'm more important than that, I'm a car buyer and if something doesn't look right it will not pass the second purchase consideration hurdle -looks. (The first naturally being price bracket.) Unfortunately, excellent proportions do not wholly constitute excellent design and looking beyond the proportions of this vehicle, it's the style and detail which let it down. It's hideously ugly but well proportioned. Second hurdle therefore failed which was a fanciful decision because it fell at the first in any case. After 4 months more, it still looks like it was designed with a crayon by someone with two broken wrists. I am a big defender of people's right to buy what the hell they like. You make your money you make your own choices. However there are limits and the bentayga is a step too far. Hideous wealth display machine, that has no purpose but to display wealth, as it has no real external design merit. If you want spend your hard earned, please don't do it on one of these, buy something nice. I'd hate to pay less than £800 for a service for my Bentley. What would people think? I'd willingly pay a bit more if they used the golden spanners. That's sooooo déclassé- I have Gary lineker and Kelly Brooks servicing mine and it is a snip at £5000 to top up the washer fluid. The washer fluid is supplied inside a live leopard carried by a smurf.